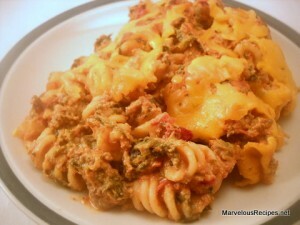 Simple, easy and delicious comfort food! 1. Cook the rotini pasta according to package directions; drain. In a large skillet, cook the ground beef over medium-high heat until the meat is no longer pink; drain and return to the skillet. 2. Stir in the cooked pasta, spaghetti sauce, sour cream, spinach, Parmesan cheese and Italian seasoning. Spoon into a 13×9-inch casserole dish sprayed with cooking spray. Top with the cheddar cheese. 3. Bake at 350 degrees F for 25 to 30 minutes or until bubbly and cheese is melted. Makes 8 to 10 servings. * You may substitute 1 (10 oz) package frozen broccoli, thawed, for the spinach, if desired.